The Maple Run School District phones are back up and running. Thanks for your patience while we dealt with the issue! Due to the predicted storm, both the Girls on the Run and the Heart and Sole running groups will not be meeting Saturday morning. Please be safe and we'll see everyone at practice on Thursday. Coach Laurie, Coach Rachael, Coach Jauna, and Coach Terra. It is hard to believe but we are already planning for summer. Please mark you calendars. If you are interested in accessing the Warner Scholarship Program those applications are due on April 1st. Spirit Week Continues on Wednesday: It's Time to Play Support your favorite team, hobby or come as you are wearing athletic wear. School Safety Message: Earlier this afternoon (Tuesday, February 19th) SATEC was asked by the St. Albans PD to enter into a Secure the School (for approximately 20 minutes) as a precautionary measure for an incident off campus and not connected to our school. SATEC Spirit Week Starts on February 18th Students in PreK-8 can partake in week long activities and challenges to show their Wildcat Pride. Monday: It's Time to Serve Wear Red, White, Blue or anything that will show support for those who serve our communities and Country. It is "Favorite Hat Day" tomorrow, February 15th. 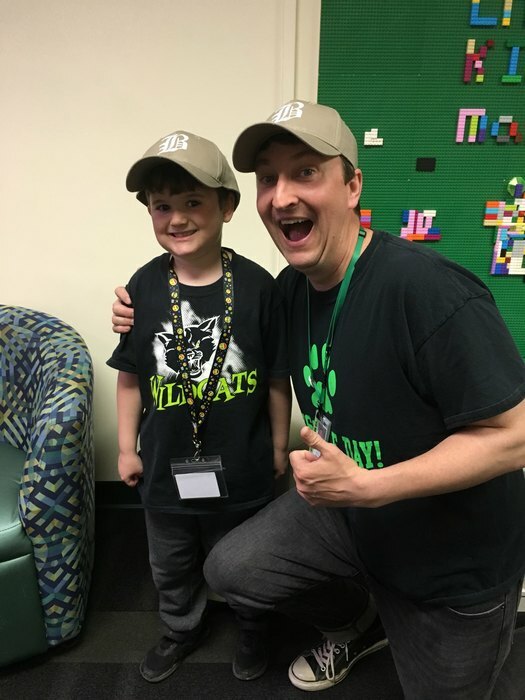 Students are encouraged to wear that hat they love the most. IMPORTANT UPDATE - MRUSD schools will be CLOSED today, 13 Feb 2019. This message from Superintendent Kevin Dirth is to notify you that due to the winter weather, and at the recommendation of officials, all schools in the Maple Run Unified School District will be closed today. There will be a 2-hour delay for schools today, 13 Feb 2019. This message from Superintendent Kevin Dirth is to notify you that due to the weather, and at the recommendation of officials, all schools in the Maple Run Unified School District will be on 2-hour delay today. 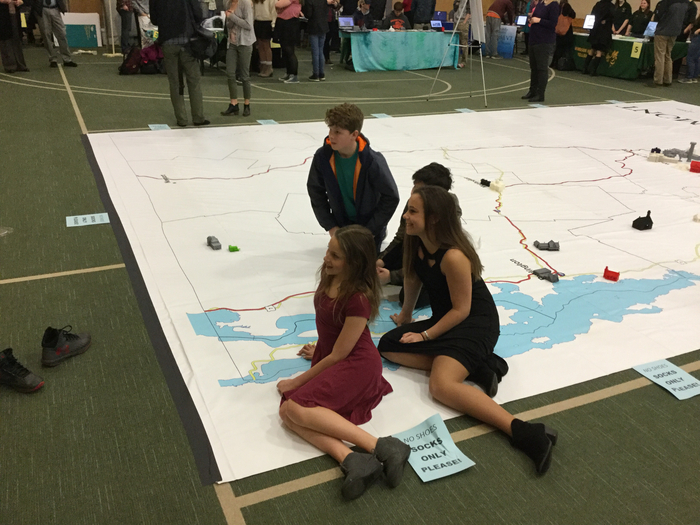 This includes Bellows Free Academy St. Albans, Northwest Technical Center, St. Albans Town Educational Center, St. Albans City School, Fairfield Center School, and all pre-school and Kindergarten programs. There will be no morning pre-school program at any Maple Run Schools today. MRUSD schools will be closed today, 7 Feb 2019. This message from Superintendent Kevin Dirth is to notify you that due to the winter weather, and at the recommendation of officials, all schools in the Maple Run Unified School District will be closed today. 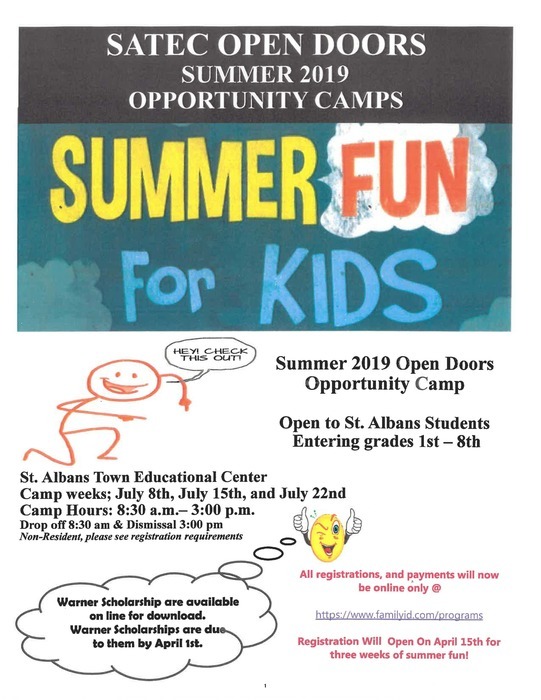 This includes Bellows Free Academy St. Albans, Northwest Technical Center, St. Albans Town Educational Center, St. Albans City School, Fairfield Center School, and all pre-school and Kindergarten programs. 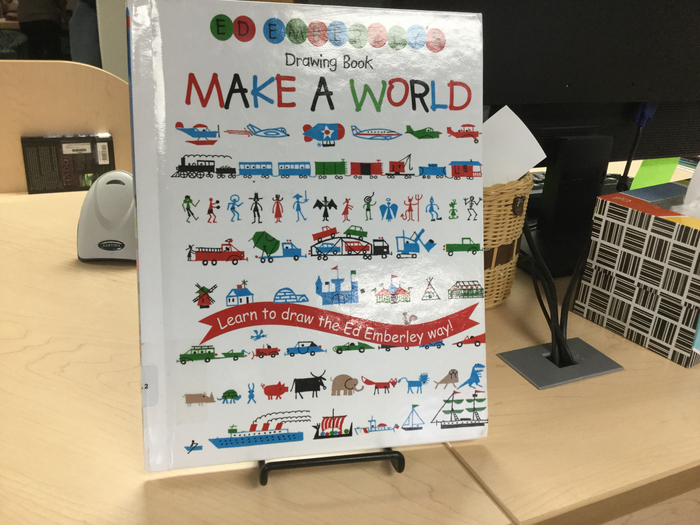 Celebrate national “Inspire Your Heart With Art Day” by checking out some art books in the library! Wednesday, 1/23- all buses just left school at 3:45 (10 minutes later than usual). Please be patient as the the roads are a bit slippery this afternoon. Due to the predicted inclement weather and road conditions all student after shool activites and atheltics have been canceled for Wednesday, 1/23/19. Tuesday, January 22nd- Due to the weather, all MRUSD schools are on 2-hour delay today: BFA St. Albans, NWTC, SATEC, SACS, Fairfield Center School, Pre k & Kindergarten. Reminder- There is no school on Monday, January 21st in observance of Martin Luther King Jr. day. Wednesday, Jan. 9th- All MRUSD schools will be closed today: Bellows Free Academy St. Albans, NWTC, SATEC, SACS, Fairfield Center School, pre-school and Kindergarten programs. Bus 12 update- as of 8:35 the bus has made it safely to the bottom of French Hill and is headed to Hill Farm to complete the route. BUS 12 Delay- due to road conditions Bus 12 is currently delayed. As of 8:25 she is on French Hill waiting for the plow trucks to salt. We will provide another update as it is available. We currently due not have an estimate on how long the delay will be. Please be advised that on Friday, December 28 from 8:00 am to 12:00 pm, we will be performing a system update of PowerSchool. PowerSchool (including PowerTeacher and the mobile app) will not be available during this time; please plan accordingly. 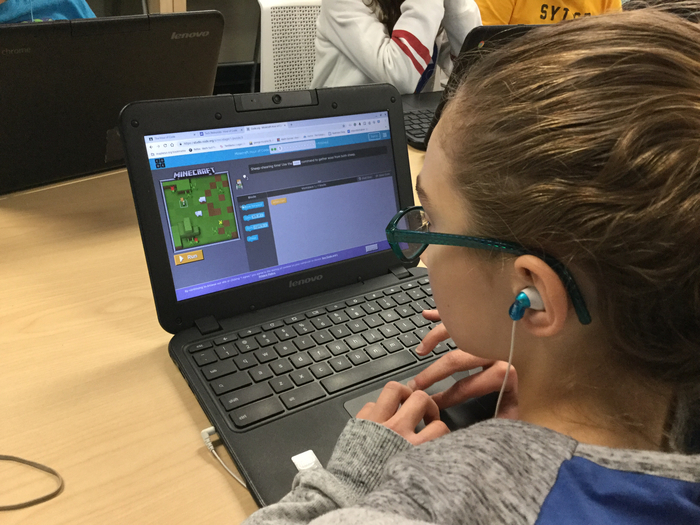 Students all around the school participated in the Hour of Code again this year. 11/27/18 - Buses running late. Due to the road conditions a number of our buses are running late. Thank you for your understanding. All MRUSD schools will be closed today (November 16th): Bellows Free Academy St. Albans, NWTC, SATEC, SACS, Fairfield Center School, pre-school and Kindergarten programs. 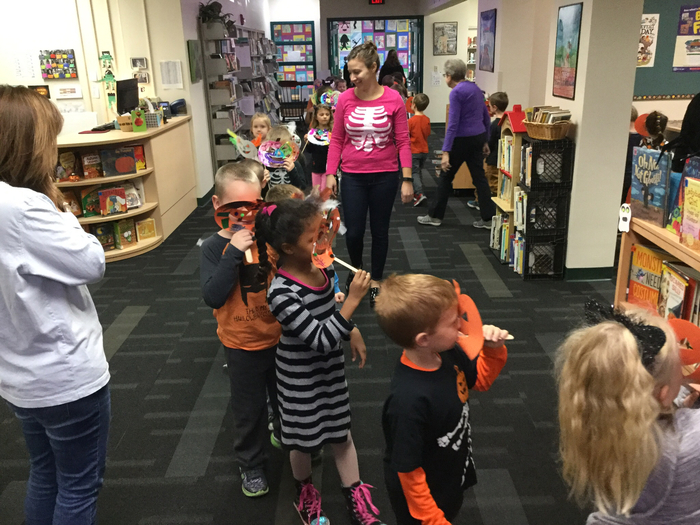 The Kindergarten Pumpkin Parade came through the library today! School pictures are coming up on October 4th and 5th. Please look for the picture envelopes that are headed home. We have posted the schedule on our Facebook page and will be adding it to the Daily Announcements. 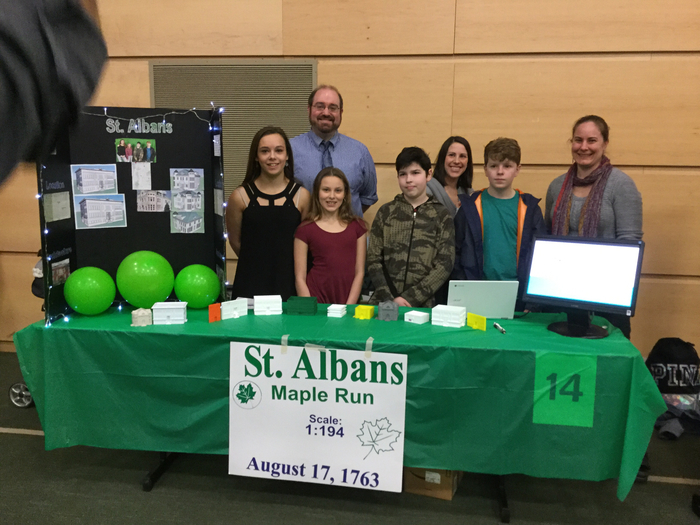 This is Angela Stebbins, Principal of Saint Albans Town Educational Center. Today is Monday, September 24th. At about 9:40am we detected what wed thought was a gas leak in the building. All students and staff were evacuated outside the building and we were prepared to bus students home if needed. The FD arrived immediately and helped us assess the situation. The FD declared the entire building safe and we were able to have all students and staff safely re-enter the building by 10:10am. Kindergarten field trip will continue as planned. We thank you for your understanding and support during this situation. Thank you. As you may be aware, there was an off campus incident in St. Albans City late this morning. As a precaution, St. Albans PD requested that local schools, including SATEC, go into a modified lockdown. 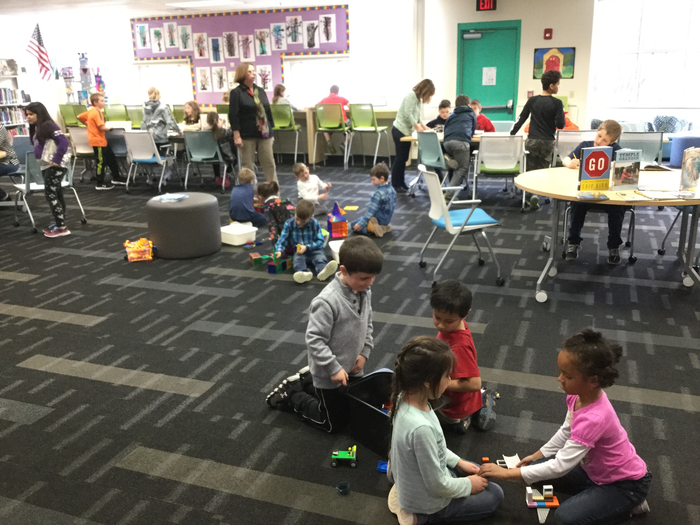 This means that students were not allowed outside during this time, but they were able to move around freely inside the school and continue their learning. We resumed normal activity within 45 minutes. Due to the high heat index all after school athletic practices at SATEC are canceled for this afternoon (Wednesday, 9/5). 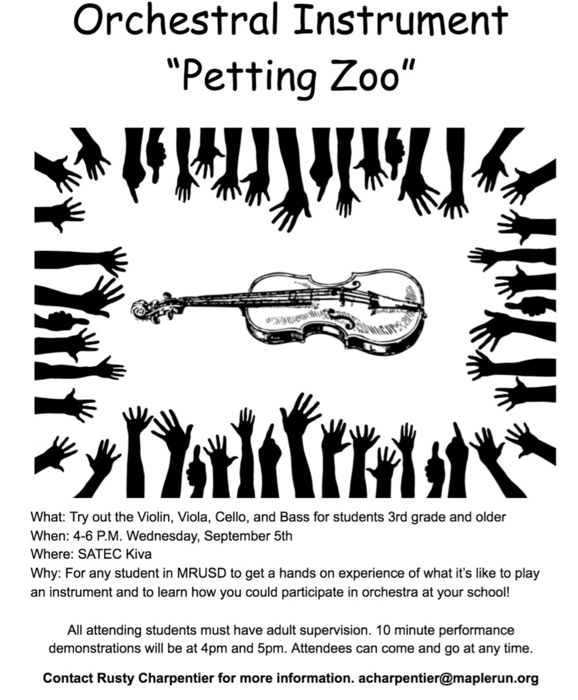 Come to the Orchestra Petting Zoo on Wednesday, September 5th any time from 4-6pm in the SATEC Kiva to get a hands on experience of what it's like to play an orchestra instrument! SATEC buses are running 10 minutes behind. Thank you for your patience on our first day. We are excited to welcome all of our 1st-8th grade students back for their first day tomorrow (8/29). 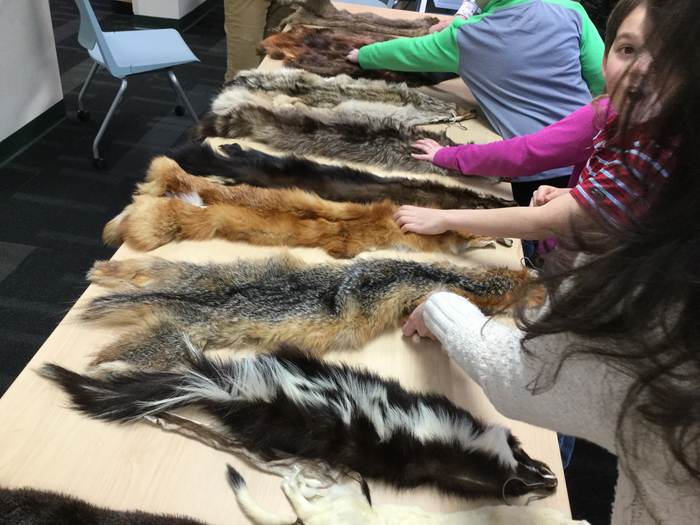 This is a full day for SATEC students. SATEC is in the process of upgrading the existing phone system and as part of that process we will be without phones for portions of the day on Monday, August 13th. We apologize for any inconvenience and thank you for your understanding. 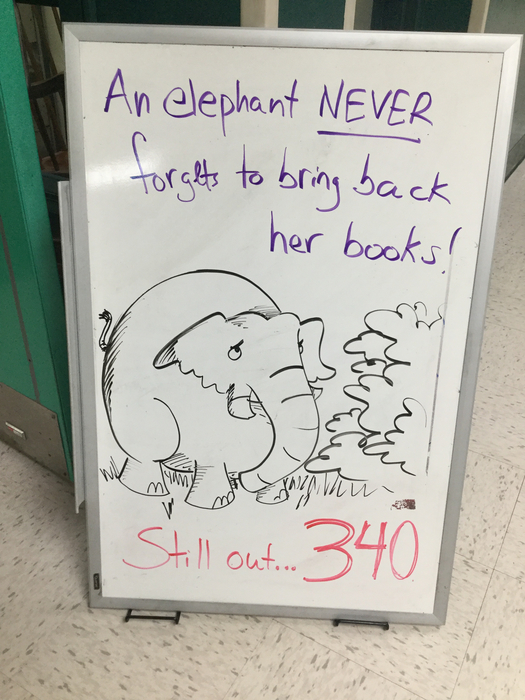 We’re so close… Please remember to bring back those library books! 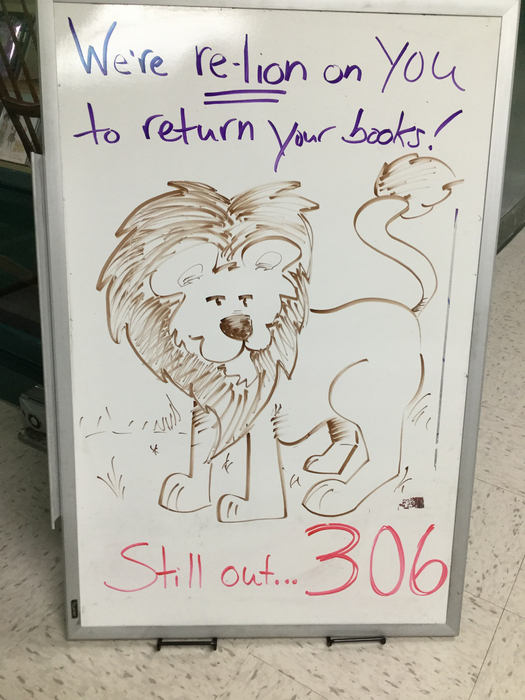 The SATEC Library closes for the summer next week, so get your books in as soon as you can! 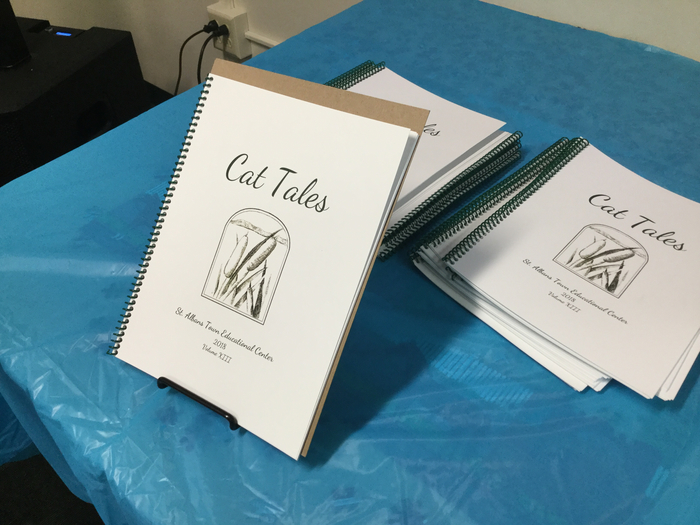 SATEC students receive their copy of the Cat Tales annual featuring student-created literature and artwork. Mr. Flanagan and many others helped make this magazine possible. Spring Bands Concert 7pm this evening! 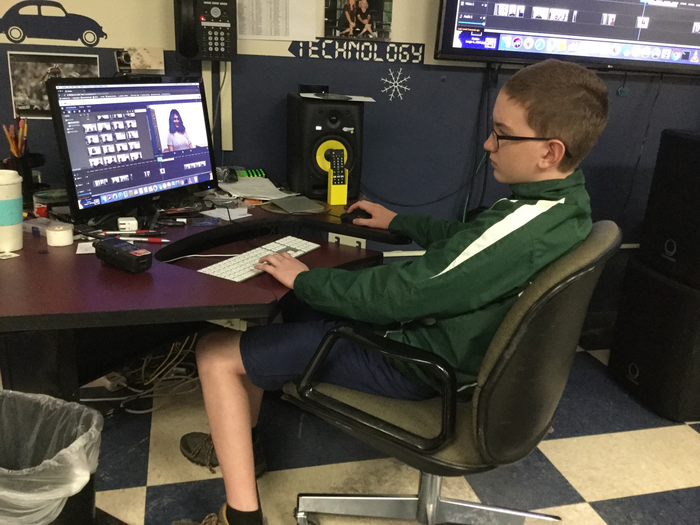 Current 8th graders create a video for incoming 7th graders. 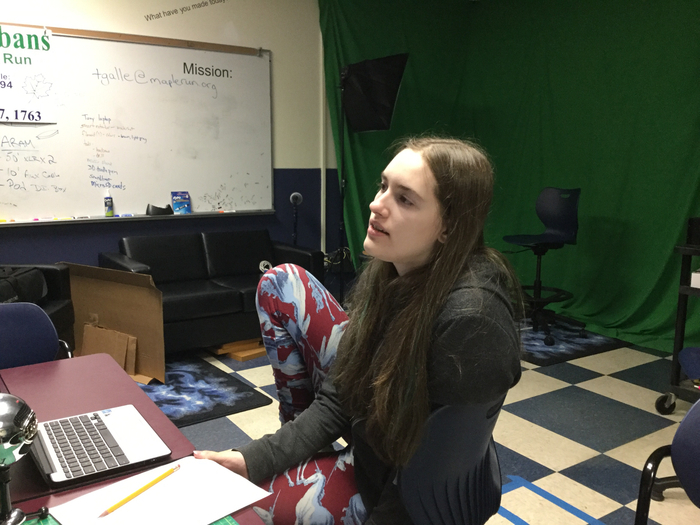 Kate directs while Logan edits. Bus 11 will be running 5-10 minutes late this afternoon (Thursday, May 17th). 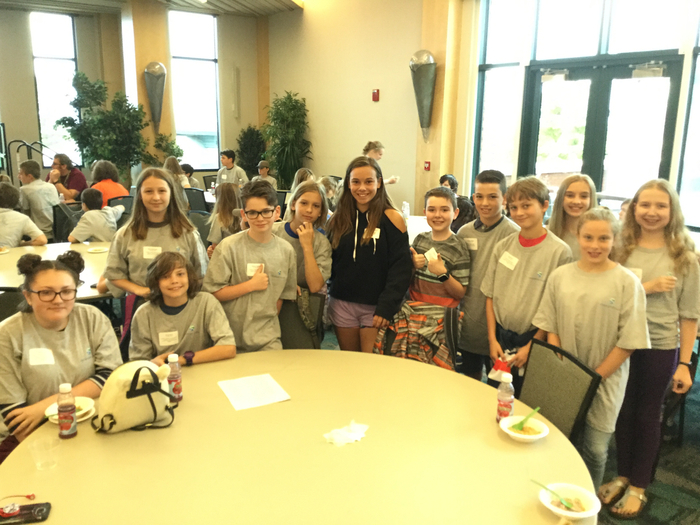 6th graders participating in the ROOTS science and engineering workshops at Champlain College. Reminder No school Friday, May 4th for Parent Conferences. Parent Teacher Conferences -Pick A Time became accessible on April 16th to schedule your Parent/Teacher Conference. Here is the link to Pick A time to set up your Parent/Teacher Conference. 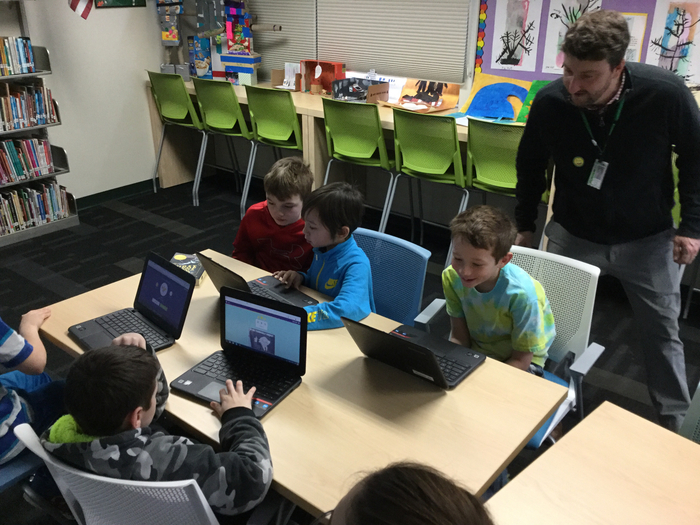 https://pickatime.com/client?ven=11604845&event=306323 Parent/Teacher conference dates will be May 2nd, 3rd and 4th (no school for students on May 4th). If you do not have internet access or need additional help setting up your conference, please call Tammy Deso 752-2700. The phones and internet are back up and running at SATEC. We are currently experiencing an outage of out phone system and internet. 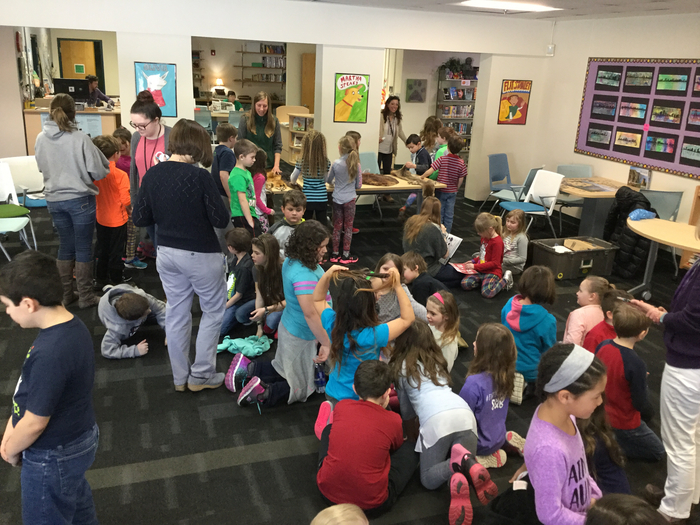 Correction, SATEC end of year dates can be found in the “Events” section of our website and in the April News from The Principal’s Office. 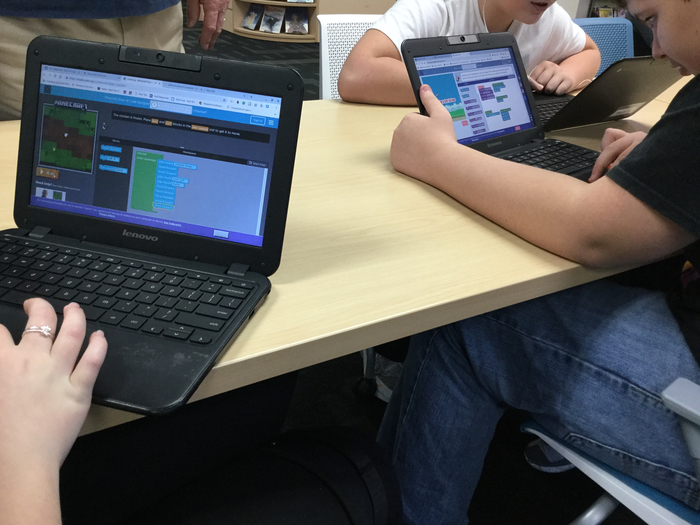 We have updated the calendar section of our website with end of year dates for SATEC students. REMINDER -St. Albans Town Educational Center will host a Kindergarten Open House for the upcoming school year on Tuesday, April 3, 2018 at 4:00 PM – 4:45 PM or 5:00 PM- 5:45PM. 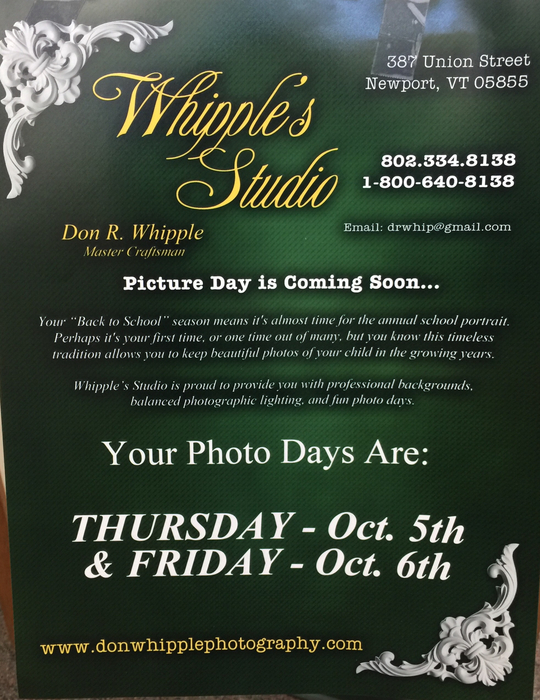 If you live in St. Albans Town and your child will be 5 years old by September 1, 2018 please stop by and visit. 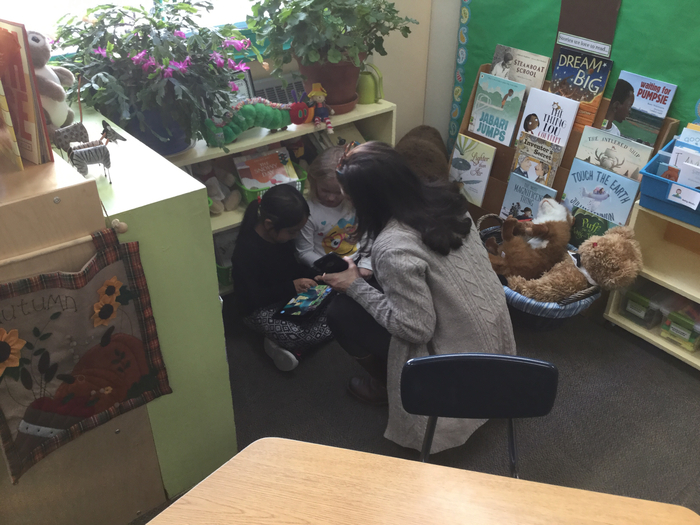 You and your child will get a chance to meet the teachers, other staff, and tour the Kindergarten. If you have not yet registered your child, this is an opportunity to do so. We will also be scheduling Kindergarten Screenings for June. If you are unable to attend, you can stop by the office any school day from 7:45 to 3:30 to pick up a registration packet. SATEC Bus Route 12 is running about 15 minutes late this afternoon (Monday, April 2nd). SATEC Drama presents "Olivia" on April 12th beginning at 7pm in the SATEC Gymnasium. Kindergarten visit night will be April 3rd. There are two sessions. 4:00-4:45 and 5:00-5:45. Please join us for a tour of the classrooms and a chance to meet our teachers. 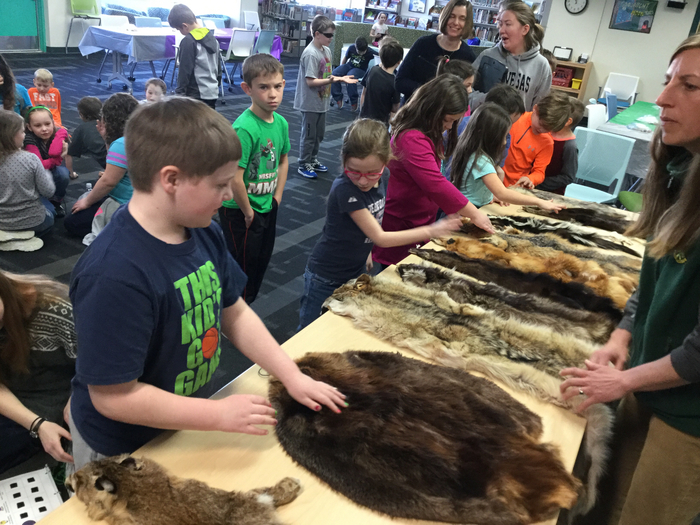 2nd grade students @satecvt learn about winter wildlife with VT Fish & Wildlife’s Project WILD coordinaror, Alison Thomas. 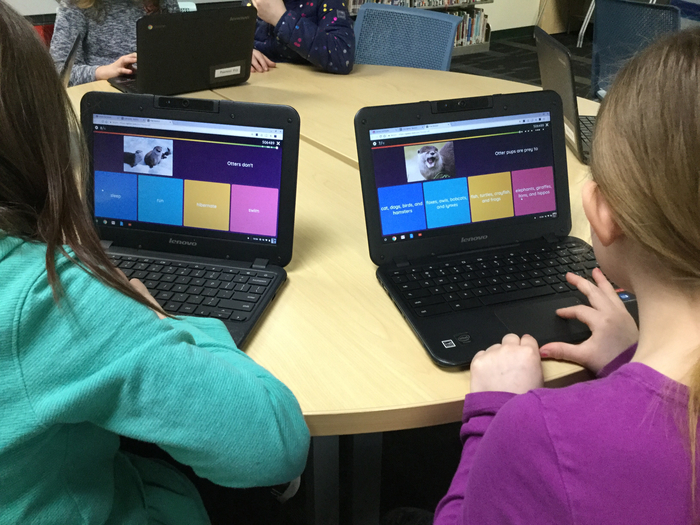 Mr. Flanagan (@phlanclan) uses Quizizz.com to assess his 3rd graders after a Library lesson on otters. Paws-itive Pies for PBIS! School Wide Coin Challenge In place of the Penny War, will be hosting a coin challenge. 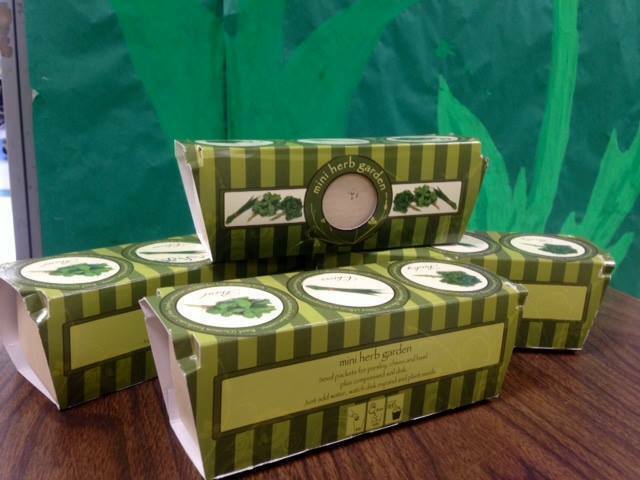 Each Grade will have the opportunity to bring in silver coins starting Tuesday, February 13th through the 22nd. The top two grades (one grade from K-4 and one grade 5-8) that have the most amount of money raised will get the chance to put a pie in their teachers’ or staff members that works with in the grade face during our spirit assembly on Friday the 19th. Teachers and students will be drawn that day. All the money raised will go towards PBIS celebrations! Each Grade will have the opportunity to bring in silver coins starting Tuesday, February 13th through the 22nd. Attention to all parents with 1st and 2nd grade students. I am looking forward to the wonderful night of art and music next Thursday, the 15th. Please remember, all students should aim to be in their classrooms at 5:30, with their concert to start at 6:00. Students should try to be dressed in concert attire. I will challenge them to try and dress nicer than I am! Mr. Barsumian Following the concert, please feel free to peruse the artwork created by your children. Drama Cancellation for 1/31/18: Due to the Drama Coaches being ill we will have to cancel Drama Practice for this evening 1/31/18. 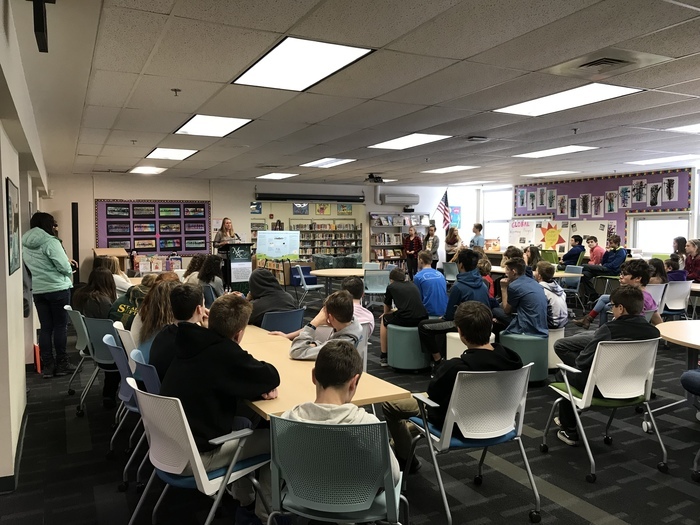 8th-9th Grade BFA Registration Night For SATEC Students: BFA will be coming to SATEC to meet with parents of 8th graders on Wednesday, January 31st from 6:00 to 7:00. We'll discuss the transition from middle to high school as well as the process for registering for classes. This is a great opportunity to ask questions, gather information, and fill out required forms. We look forward to seeing you on Wednesday. If you have questions, please contact Don Fagnant at 752-2782. 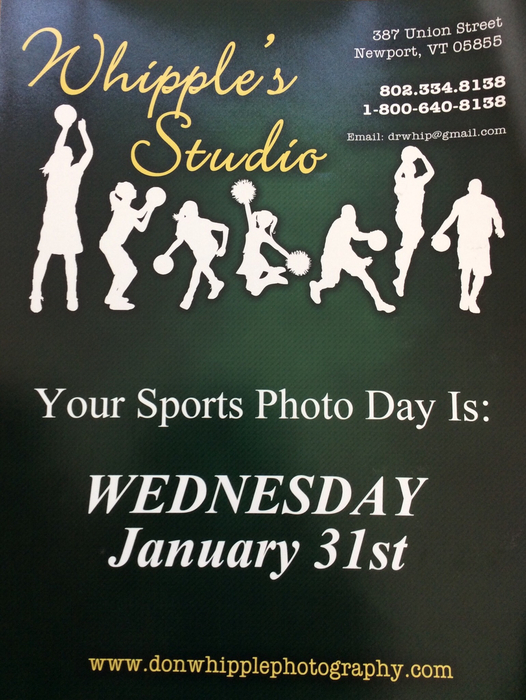 SATEC Sports Photo forms were handed out last week. See you for photos on the 31st. Winter Chorus Concert will begin at 7pm this evening. We hope to see you there. Reminder that the Winter Bands Concert will begin at 7pm tonight. Reminder that there is no school on Monday, January 15th in observance of Martin Luther King Jr. Day. 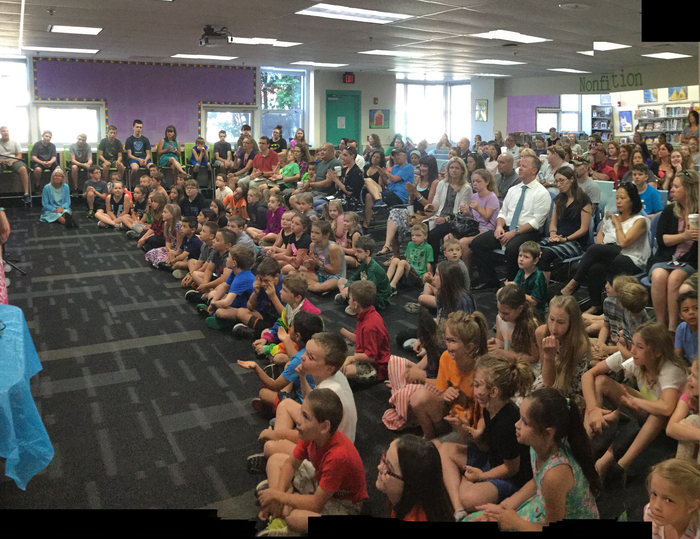 https://youtu.be/WmPtWs2lhDI PBiS Kindness Booster Kickoff. Grades 1 & 2 Fine Arts Night correction- the date is Thursday, February 15th. This message from Superintendent Kevin Dirth is to notify you that due to dangerous wind chills, high winds and blowing snow, all schools in the Maple Run Unified School District are closed tomorrow, Friday, January 5. 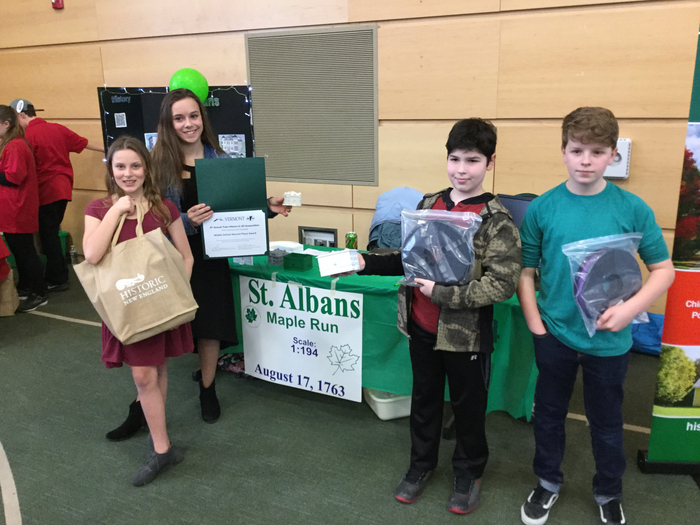 This includes Bellows Free Academy St. Albans, Northwest Technical Center, St. Albans Town Educational Center, St. Albans City School, Fairfield Center School, and all pre-school and Kindergarten programs. 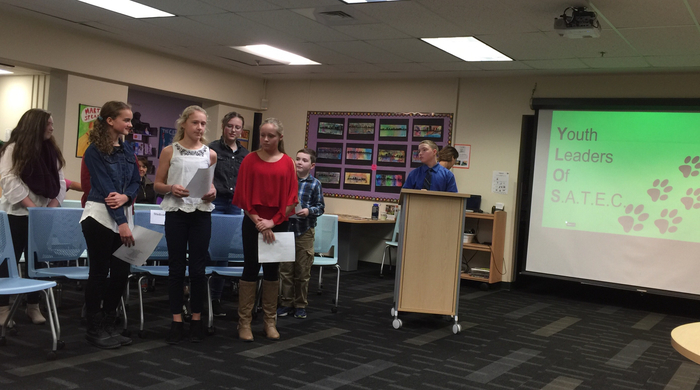 SATEC Youth Leaders present to the MRUSD School Board. Great job!! The CHAMP Community in 5th grade is once again holding a Diaper Drive. Please check our Daily Announcements for more details. 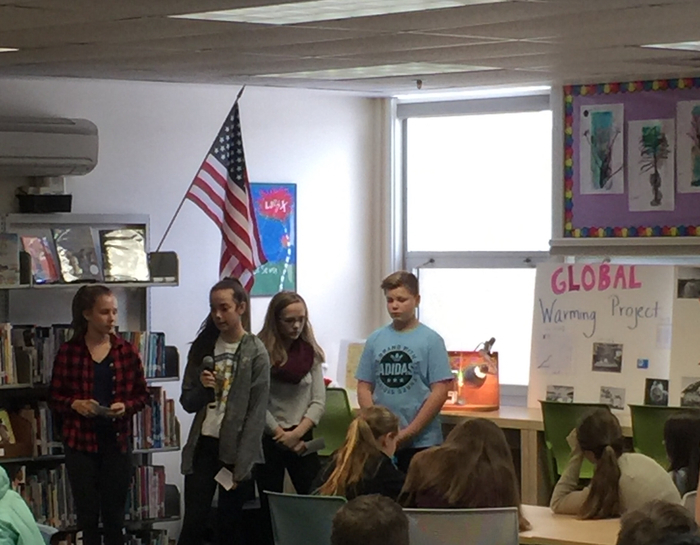 8th grade students sharing some of their solar learning! 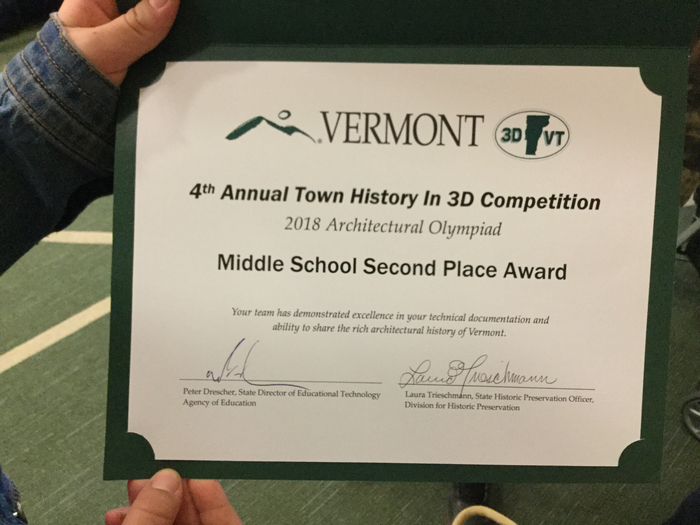 Great job by SATEC students! 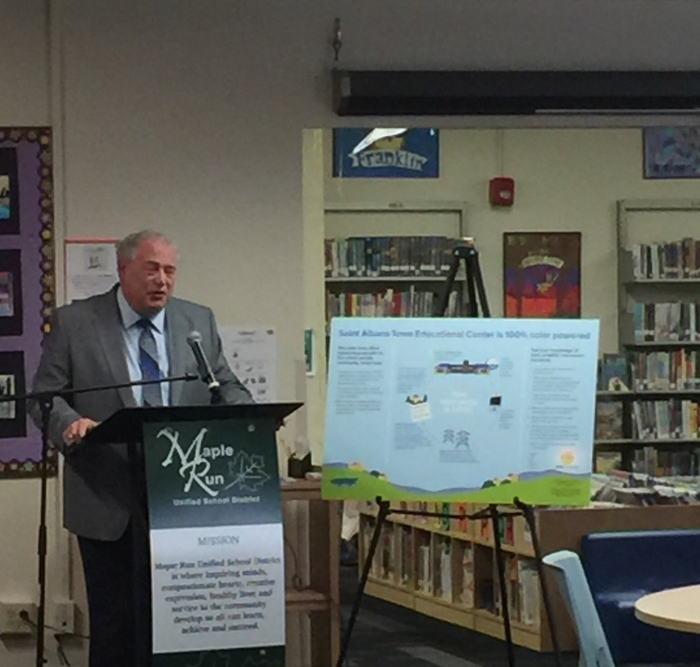 Dr. Dirth sharing the vision for Maple Run and solar energy. The SATEC project is just the beginning with projects approved for City School and Collins Perley. Kicking off the unveiling of our finalized rooftop solar project. Thanks to Sun Common for working with us on this project. No school November 22nd-24th for Thanksgiving Break. Happy Thanksgiving! Due to the Thanksgiving Feast on Friday, November 17th we will not be holding School Sing. See you at School Sing on 12/1. Building purchase vote for the Catherine St. building that houses our MRUSD offices will be happening on 11/14. Town residents can vote from 7am-7pm at Collins Perley. 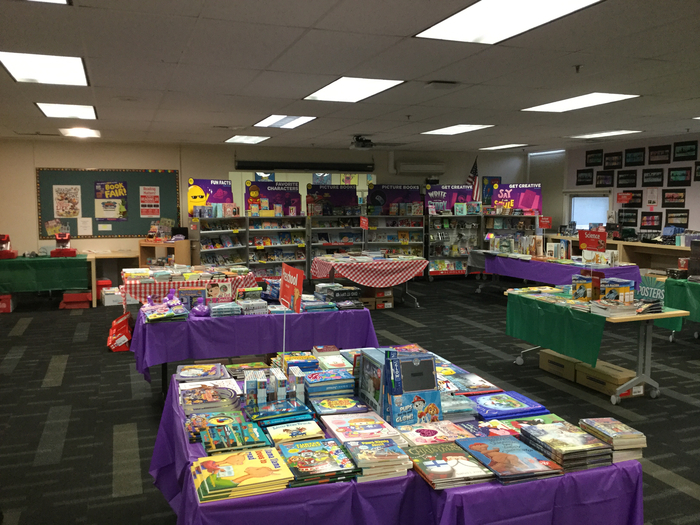 The Wild West Book Fair comes to SATEC 11/6-11/10. See you there! SATEC has internet again. Thank you for your patience during our outage this week. Breakfast After The Bell starts on Monday, 11/6. 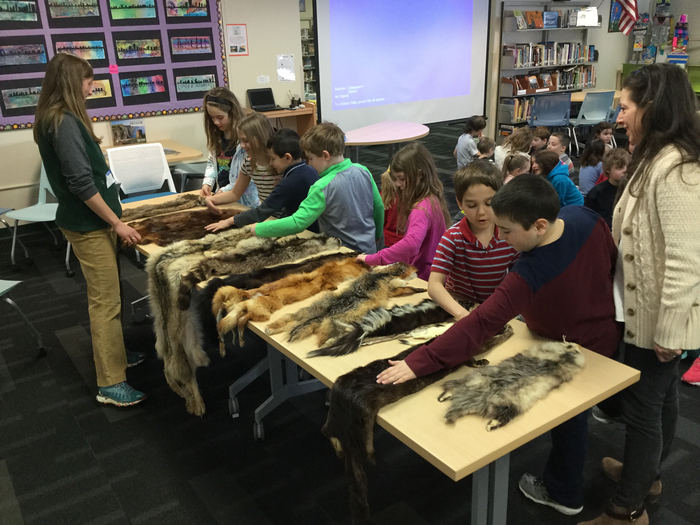 Students order the day before in their classroom. More details in our daily announcements. Reminder that there is no school for students on Friday, November 3rd due to Parent/Teacher Conferences. Due to high winds, downed trees and power outages, police have recommended that schools be closed today. All schools in the Maple Run Unified School District are closed today, Monday October 30. 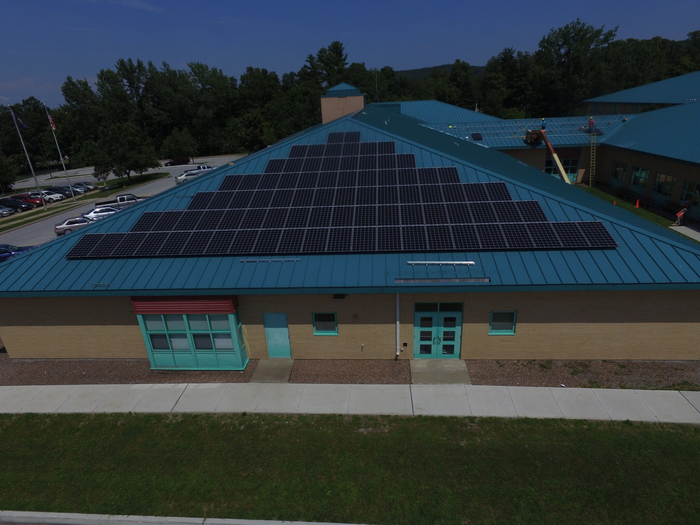 This includes Bellows Free Academy St. Albans, Northwest Technical Center, St. Albans Town Educational Center, St. Albans City School, Fairfield Center School, and all pre-school and Kindergarten programs. The SATEC 5th & 6th Grade Spelling Team will host the Regional Competition on Saturday, Oct. 28th @ 9am in our library. 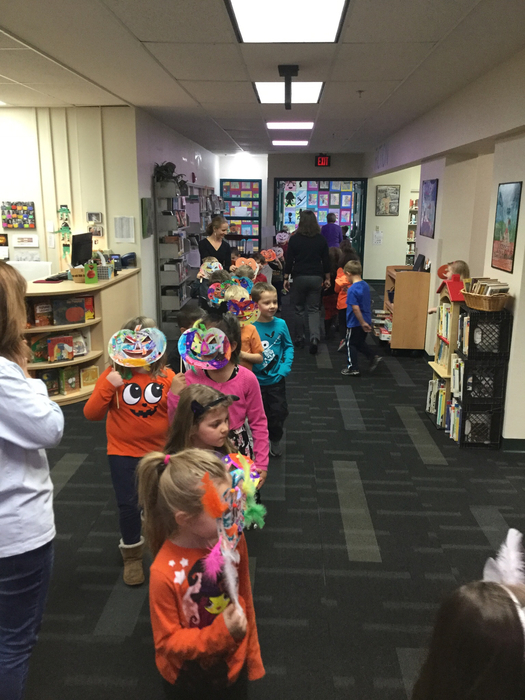 MRUSD Art Show is now at Collins Perley. Opening reception Tues. 10/24, 4:30-6:30. Please remember to sign up for Parent/Teacher Conferences. Need help? Call Tammy at 752-2700. 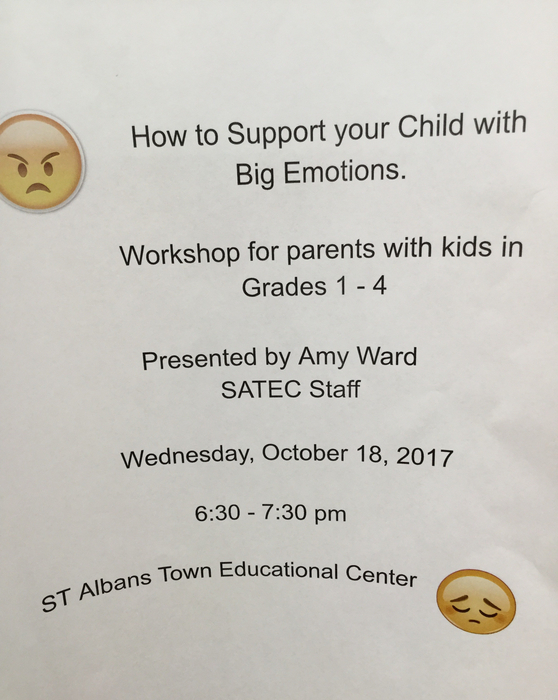 School Counselor, Amy Ward will be hosting a workshop on helping students with their emotions. There will be no school for students on 10/19 & 10/20. PickATime for scheduling Parent/Teacher conferences will be available on 10/17/17. Conferences are 11/1-11/3. 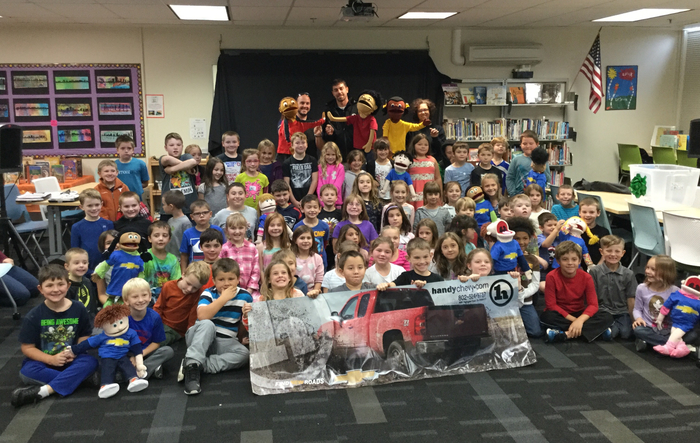 Thanks to Handy Chevrolet for bringing Puppets in Education to SATEC. 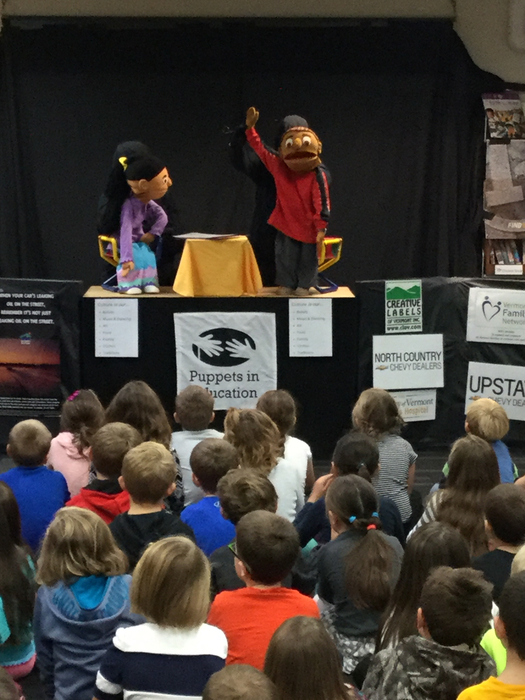 Just a reminder that Puppets in Education will be at SATEC for grades K-4 on Monday, October 16th. Good luck to the SATEC Spelling Bee Teams at the District Spelling Bee being held at SACS this morning. 8th Grade Parent Technology and Your Teenager Night. Wednesday, Oct 11th from 6:30 PM to 8:00 PM in the SATEC Library. We hope to see you there. 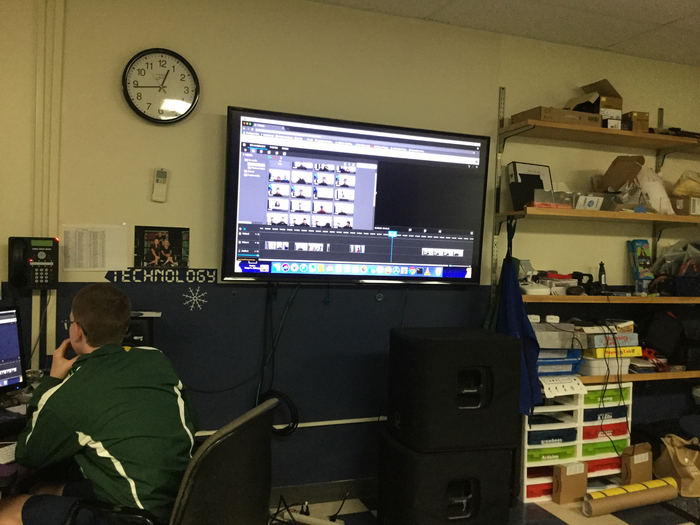 Picture times were posted earlier this week and have been running in our daily announcements. 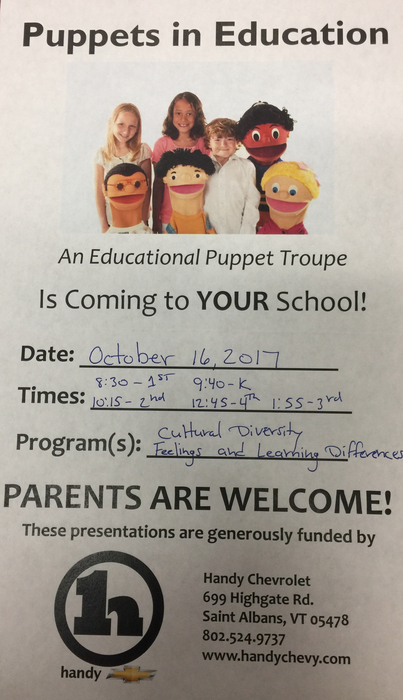 Puppets in Education will be coming to SATEC on 10/16 to present to students in Grades K-4 about Cultural Diversity, Feelings and Learning Differences. A flyer will be coming home with K-4 students later this week. School pictures will be this Thursday and Friday. 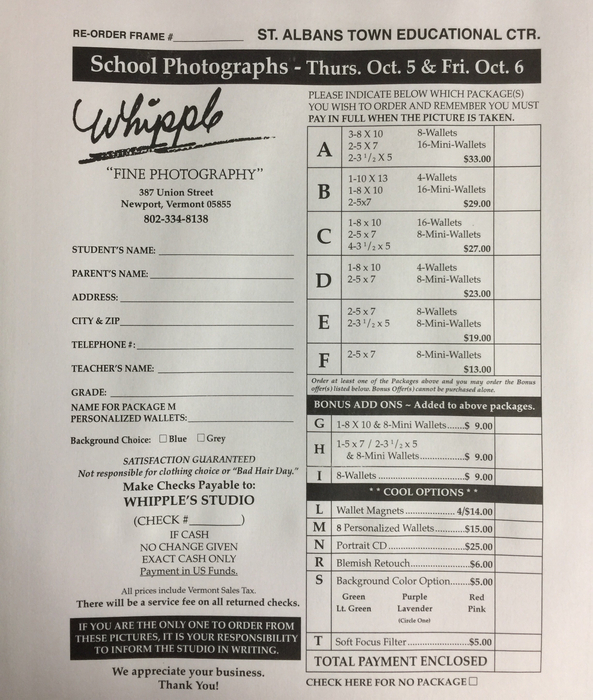 School Pictures are Oct. 5th & 6th. Sports Pictures are Oct. 5th. The detailed schedule for school photos is in the "News" section. Update from Athletic Dept. Due to the heat index all games and practices for Wednesday, 9/27 have been cancelled. We'll see everyone this evening at Open House. K-4 from 5:30-6:30 and 5-8 from 6:00-7:00. Bus 7 is running behind schedule by about 10 minutes this evening. All other buses are on schedule. Please mark our Open house on your calendars for Wednesday, September 27th. K-4 5:30-6:30pm and 5-8 6:00-7:00pm. SATEC buses were delayed in getting to school due to a train. We are currently running 10 minutes behind schedule. Hey folks! We are mobile! Go to the App Store or Google Play Store and search for the Maple Run Unified School District App. You'll have access to information at your fingertips on the go! 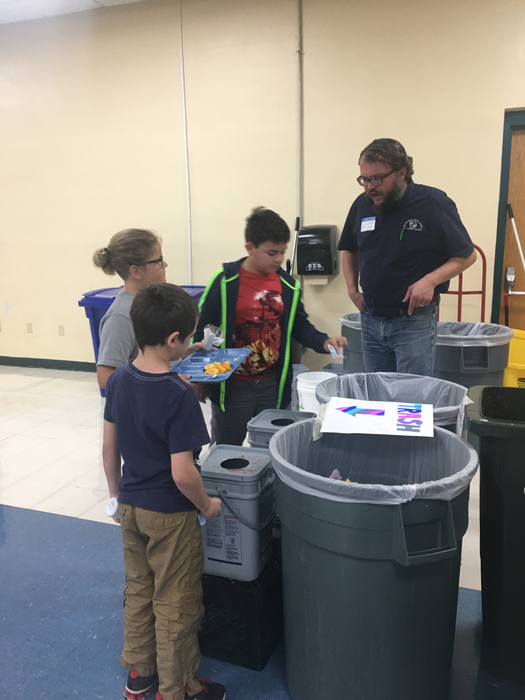 SATEC launches a schoolwide composting program. Thanks to NWSWD Rep Aaron for getting us started! Reminder that school will be closed on Monday, 9/4 in observance of Labor Day. Are you a parent of a K thru 4th grader interested in being involved in your child's classroom? Please consider volunteering with the Four Winds Nature Program for as little as a couple hours per month! Contact Myles Miller, the SATEC Four Winds Coordinator, at SATECFourWinds@gmail.com for more information. 1st & 2nd Grade parents and guardians please join us this evening for "The Night Before School For Parents" from 6:30-7:30. We look forward to welcoming back all our 1st-8th grade students tomorrow morning (8/30). 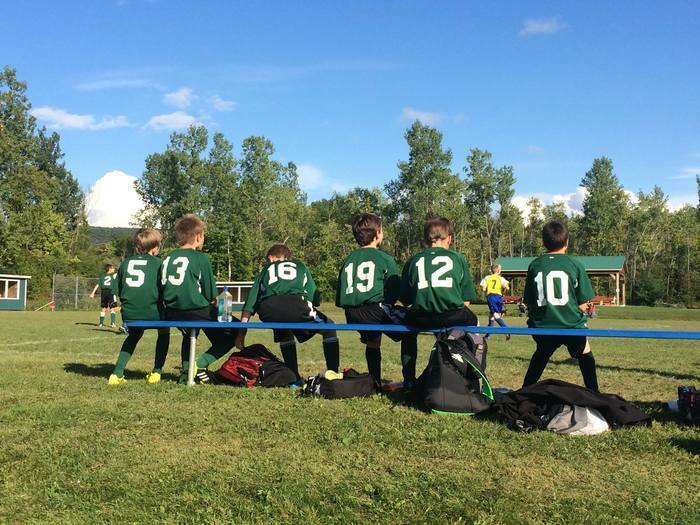 "Future Comets" free soccer clinic this Wednesday, August 23rd. The BFA Girls Soccer Program invites any 5-8 girls soccer players from SATEC, St. Albans City and Fairfield to join them from 4:30-5:30 at the Complex. Players should come ready to play with cleats, shin guards, soccer socks and a water bottle. SATEC Athletic Director, Rose Bedard will also be on site. Please feel free to share this wonderful opportunity with others in the Maple Run community. Looking for information on the first day of school? Please check the "News" section of our website. 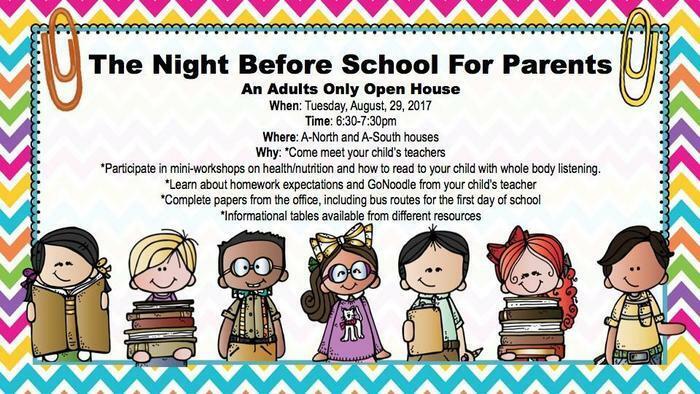 A South (1st Grade) & A North (2nd Grade) is excited to announce a back to school event for Parents & Guardians on Tues. 8/29 from 6:30-7:30. SATEC's Soccer Clinic begins this evening for grades 5-8. Boys begin at 4pm and Girls begin at 5:30. 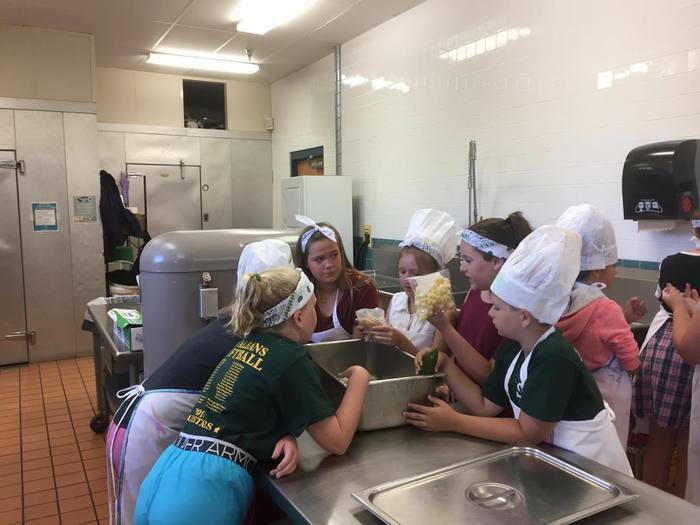 Nature's Art Camp had the opportunity to work with from Rise Vermont to plant herbs pots and play some active games focused on nutrition. 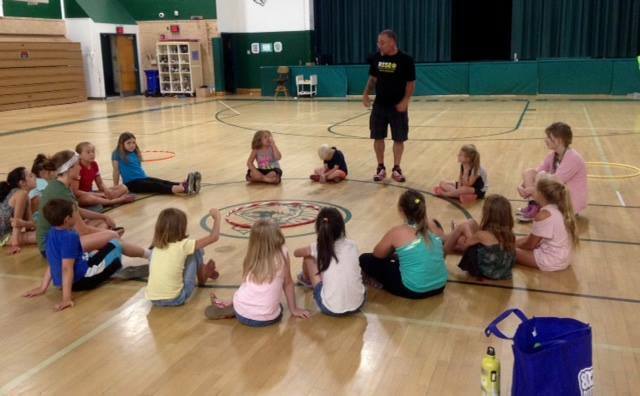 Another successful day at Open Door's "All For Fun" Summer Camp. 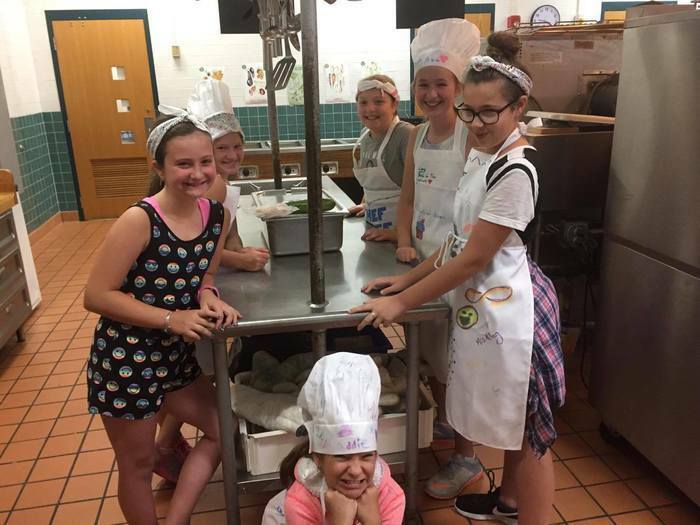 Mrs.Kings' chefs gather ideas and smiles as they create their masterpieces for our own version of "Kids Chopping Block." 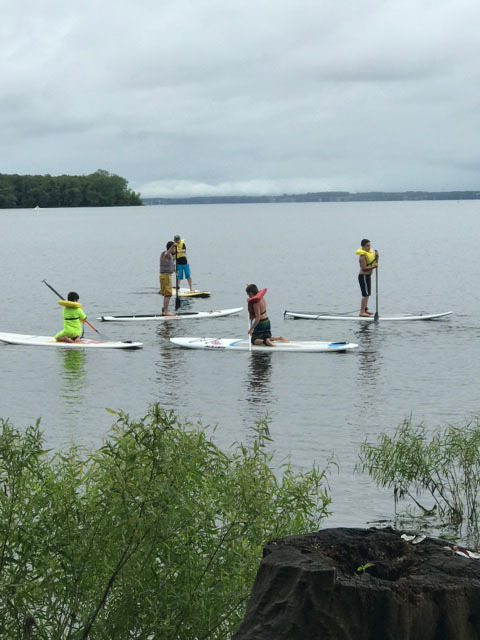 SATEC Open Doors learned how to paddleboard today! 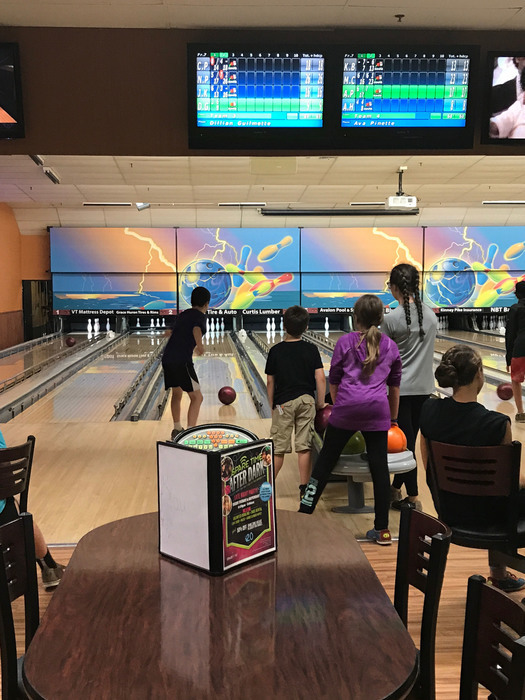 SATEC Open Doors Summer Sports Camp goes bowling! SATEC Athletics will be hosting a free soccer clinic for students in grades 5-8 who are interested in playing this fall. The clinic will be held on August 7-9 at SATEC. For more info click on news. 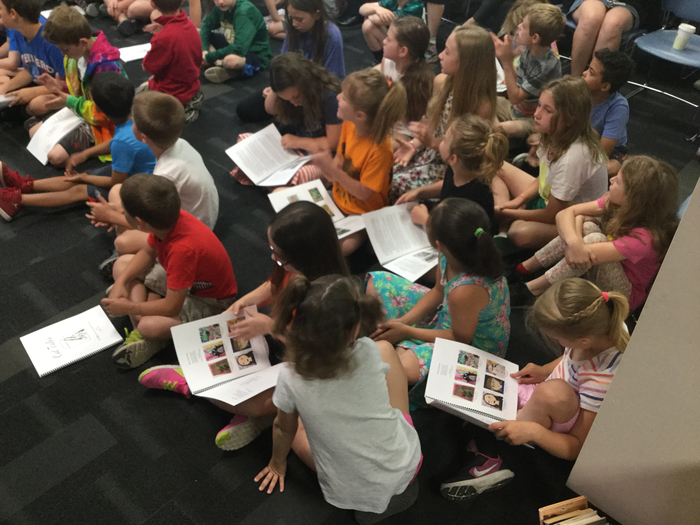 SATEC Summer School begins the week of Monday, July 10th. Please check your paperwork if you have any questions about the session your child is signed up for. Open Doors Summer Camp Week 1 begins on Monday, July 10th. Summer building hours are 6am to 5:30pm. Reminder to staff to bring their badge as doors are not always monitored. Dear Parents, With the success of our PBiS school wide behavior and academic expectations P.A.W.S, we want to celebrate our students efforts for this 2016/2017 school year! We will be having our 2nd end of year PAWS celebration Fun Day on the following dates, and would love to have parent volunteers to help us monitor games, activities, and celebrate their achievements! 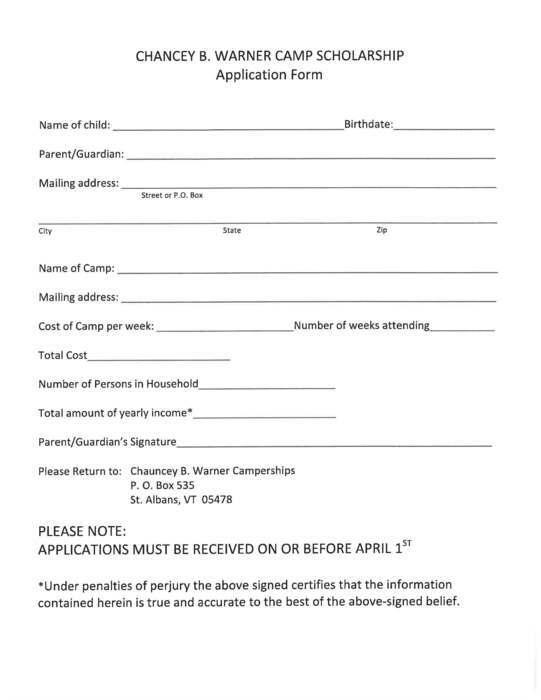 The following days are listed below: June 7th 1:30-3 PM (rain date 8th) - Grades K & 8th grade Yo Yo Fun Day June 14th 1:30 -3 PM (rain date 15th) - Grades 1st-7th Fun Day If you are interested please call Lisa Sutton 802-752-2780 with which day you may be interested in helping out. Please keep in mind that we must follow our protocols for parent/guardian volunteers. All volunteers will be required to fill out paperwork, and will need a background check if one is not currently on file. Thank You Lets Celebrate!